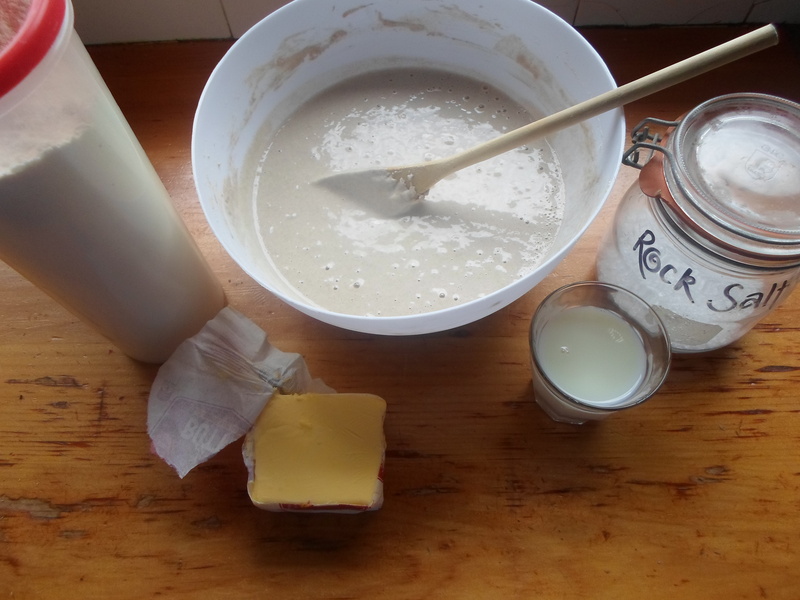 When I did my experimenting with sourdough (starter and loaf) at the end of last year I became a little obsessed with reading about different kinds of bread; how they are all made, the differences in each process and the origins and stories behind them. My main question that I desperately needed answered was how pita bread gets the big bubble of air in the middle, that convenient little pocket we all use to stuff in our favourite ingredients. Surprisingly it has nothing to do with a cleverly shaped or hollowed out wheel of dough but it actually is all on the way it’s cooked. Similar to the way a naan bread is speckled with charred air bubbles from the immense heat of the oven they are cooked in, the expansion of a pita bread comes from the heat of the pan or oven they’re cooked in. 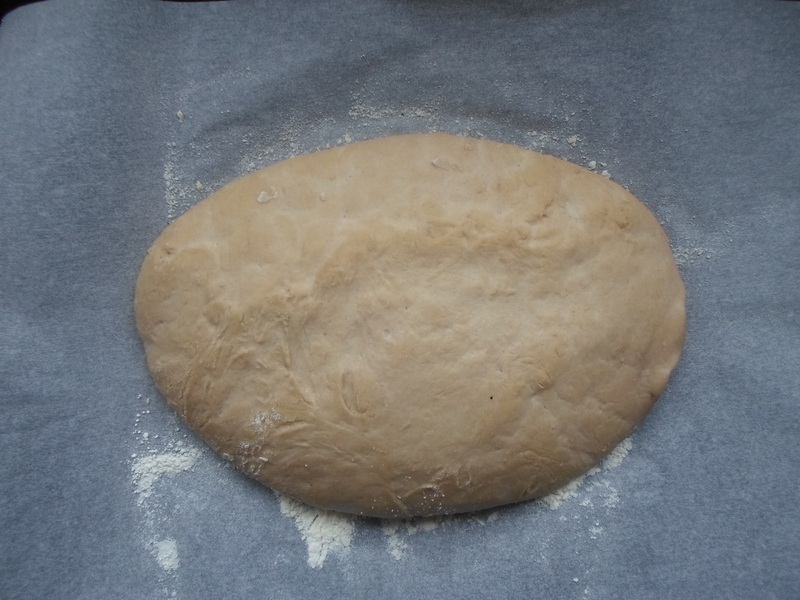 Essentially, as the active yeast begins to rise, the water within the dough begins evaporating – splitting the dough in half as it tries to escape, forming the helpful hollow we find so useful. Step one: mix it all together. Step two: knead I for five minutes. Step three: place in a bow, cover with a tea towel and leave to rise for an hour. Step four: divide into eight equally sized discs, a bit like a UFO. Only once the oven is hot enough should you even think about cooking your pita breads, if it isn’t hot enough then they won’t balloon up and you may as well have just made bread rolls. Keep an eye on them: they will only need about 3 minutes – oh, the beauty of a hot oven! They are best served hot, but delicious at room temperature too. I smeared mine with roast pepper hummus and stuffed them with pomegranate meatballs and fresh spinach. But to be completely honest, I would have eaten them plain, that’s how good they are. We are officially in summer here in New Zealand and even though that doesn’t necessarily mean endless sunshine, it does mean that fresh, crisp salads are on my mind more and more. Whenever I go to the market, I always try and buy something I don’t usually buy, there have been some failed new flavours but if you don’t open yourself up to new possibilities, you could miss the chance of finding a new favourite. Fennel is my flavour of the month, and this week I purchased what is potentially the biggest fennel bulb known to man. Usually when people use fennel, they stick with the bulb and just throw everything else away. What a waste! The stalks can be used just like celery and I used the fronds to make a fragrant salad. Begin by slicing a carrot as thinly as possible with a grater or mandolin. Coat them with a whisper of olive oil and roast until cooked through and slightly crunchy. Next, remove the fronds from the fennel bulb, you can use it for a range of things, like this salad. I steamed the fronds for a couple of minutes to bring out the aniseed flavour, and it made the kitchen smell like liquorice! 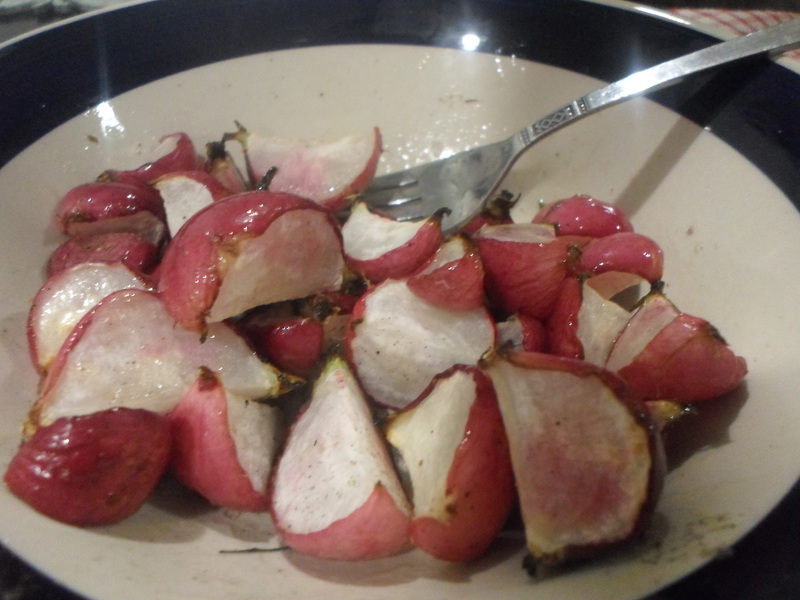 While the fronds were steaming, I sliced a couple of button mushrooms are doused them in a few teaspoons of the pickling liquid from my radishes. After drying the fronds, I tossed them through some shredded lettuce. 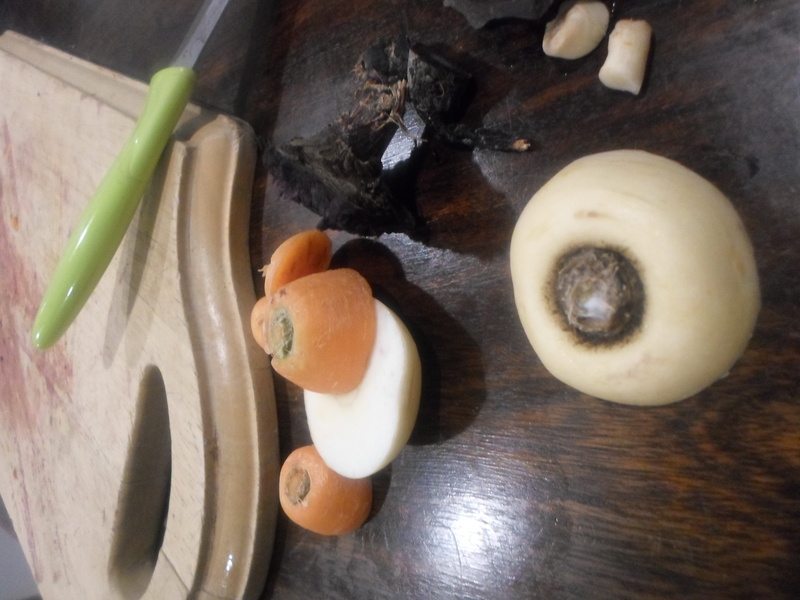 Add the mushrooms and pickling liquid with the frond salad, along with as many rondelles of pickled radish as you like. Add a dash of extra virgin olive oil and some fresh mint and parsley leaves, top with the carrot chips and you have yourself a colourful rainbow salad that’s bursting with so many flavours. It’s a perfect accompaniment to chicken, fish or red meat, or even by itself with a croute of crusty bread. I have no opening statement for this post, because I have said it all before; I love pickling things. I just love it; I love the colours it creates and I love how it captures the flavours of a season in a jar, extending the life of the ingredients and the memories. 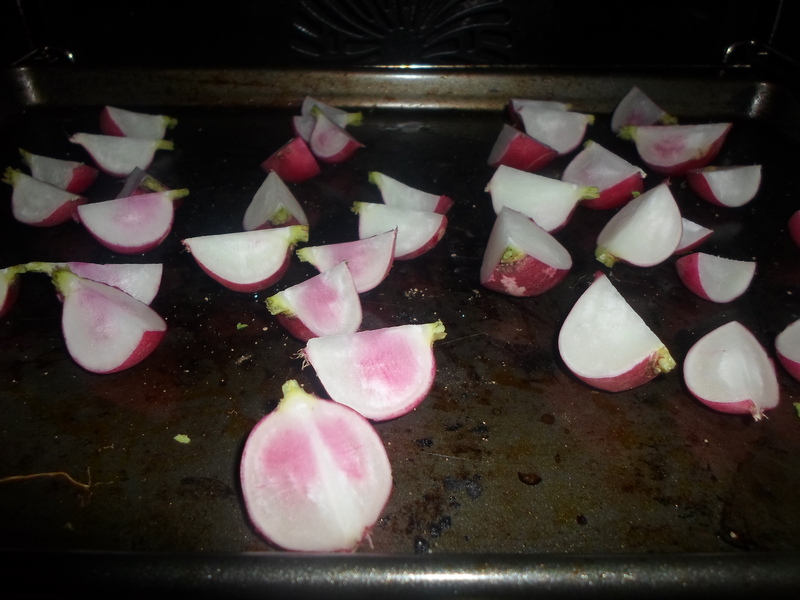 Pickled radishes are a staple in my kitchen. They are a lovely juxtaposition of sweet and tangy and brighten up any dish they are strewn over top of. The process is so simple, and unlike the lemons I pickled a few months ago, the flavour is noticeably different even within an hour. Slice a bunch of radishes as thinly as you can – either with a grater or a mandolin and pack them as tightly as you can into a glass jar. Cover them with a tablespoon of sugar, another of salt and a third of olive oil. Top with a glug of apple cider vinegar – enough for all of the radishes to be covered. 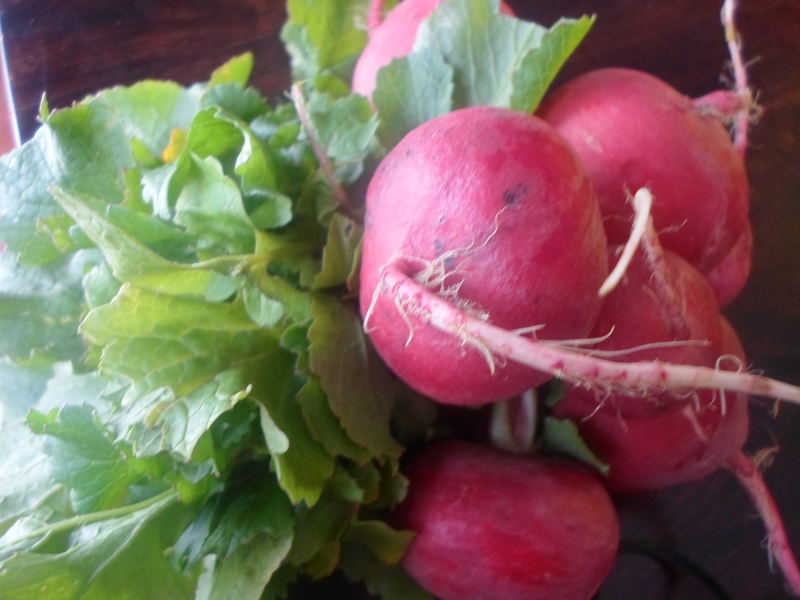 Shake it up and leave it to settle, the colour of the radishes will leach out into the liquid, colouring it a beautiful bright pink which will also be absorbed into the white flesh of the radishes. You can even experiment with what you add to the pickling solution. What’s your favourite way of doing it? With fear of repeating myself, I am trying with all my might not to start with post by saying how much I love my slow cooker. But it’s true. As well as using it for soups and stews in the winter, my favourite use of it is for slow cooking brisket. Brisket is a fatty cut of beef which, while generally quite tough, turns tender when cooked over a long period of time. The flavour is deep, the meat is rich and falls apart at the slightest touch. Cooked in a smoky barbeque or chipotle sauce, it’s great for Texan-style pulled beef sandwiches. I often drown a slab it in diced tomatoes to make a deliciously moreish Bolognese sauce, but this time I wanted to try something a little different. I found a portion of frozen pumpkin soup in the depth of my freezer and thought it was an opportune moment to get some experimentation underway. The flavour of my soup was fresh and cooling; laced with dried limes and cumin seeds so I wanted the meat to be spicy in contrast. I coated the meat in a dry rub of dried herbs, curry powder, cayenne pepper, cinnamon, ginger and lots of black pepper and set it to one side. Next, I diced an onion into the thinnest slithers I could manage and crushed a couple of cloves of garlic. I threw it all into the crock pot with a glug of oil and nestled my brisket on top, dusting the leftover spices in as well. I coated the meat with my pre-made soup; a little under two cups. As a final touch, I added a homemade stock cube and ½ a cup of water to get the flavours circulating. After leaving it to stew all day, I pulled the meat apart with two forks and added half a red pepper, thinly sliced. Starting with a bed of roasted new potatoes, I added a layer of shredded spinach and topped with a heaped serving of brisket and a sprinkling of fresh herbs. The heat of the meat cooks the spinach slightly, without wilting it beyond recognition so the dish didn’t come across as too heavy which is great for any hearty meal when it’s not winter! I have always imagined that becoming an artisanal baker would be a rather idyllic and romantic way of living life. That is probably because while my imagination cascaded ideas of kneading dough and eating crusty bread, drenched in olive oil, it also conjured up an image of doing so in a 17th century villa surrounded by fields of sunflowers that doubled as my (currently non-existent) children’s magical forest play land. I know the reality of that ever happening is slimmer than a slice of biscotti, but it’s nice to have dreams, isn’t it? Maybe I would settle for having a house with a wood fire oven, that way I could make pizza too! 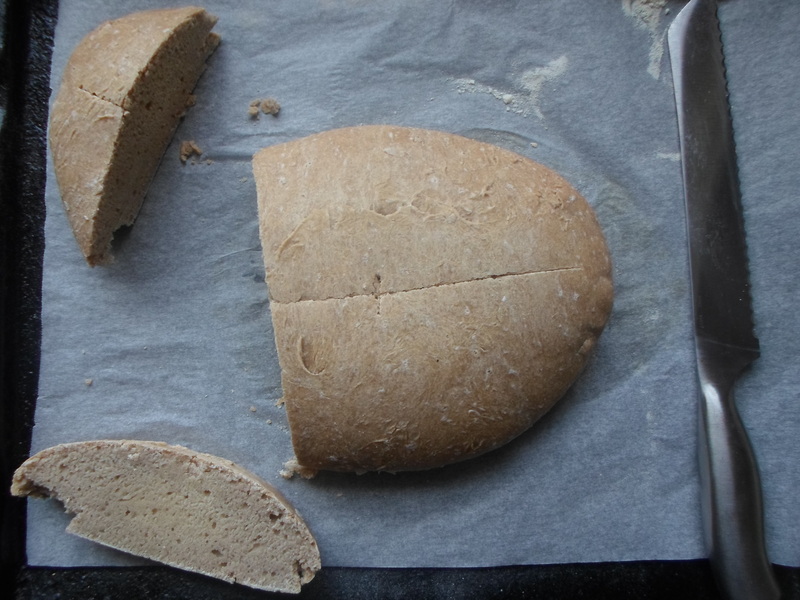 It’s great to have things we want to attain in life, but most of the time we have to start out small; in this case, a small oven – this is how my first attempt at making sourdough went. To say it was a dreary morning sounds like the beginning of an unoriginal film noir script, but it was. I only mention that because the drear filled me with dread that I was not in the best of weather conditions for bread making. But I did it anyway – I’m a trooper. I measured out two cups of my pungently fresh sourdough starter and swirled through a tablespoon of melted butter and ½ of a cup of warm milk. 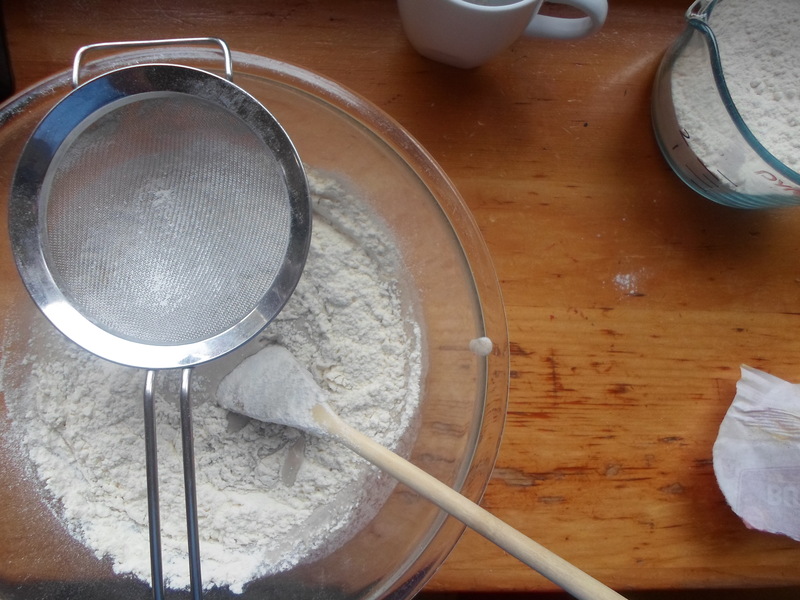 Next, I sprinkled in a teaspoon of salt and a tablespoon of sugar before sifting in 3 cups of plain white flour. 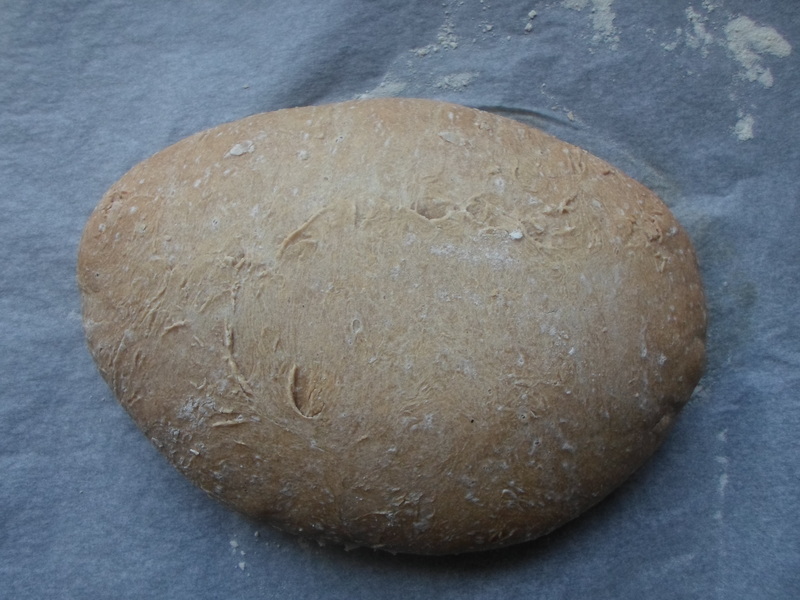 The best way to make bread dough is with your hands, though I do suggest loosely combining the mixture with a wooden spoon before taking to it with fist one and fist two. 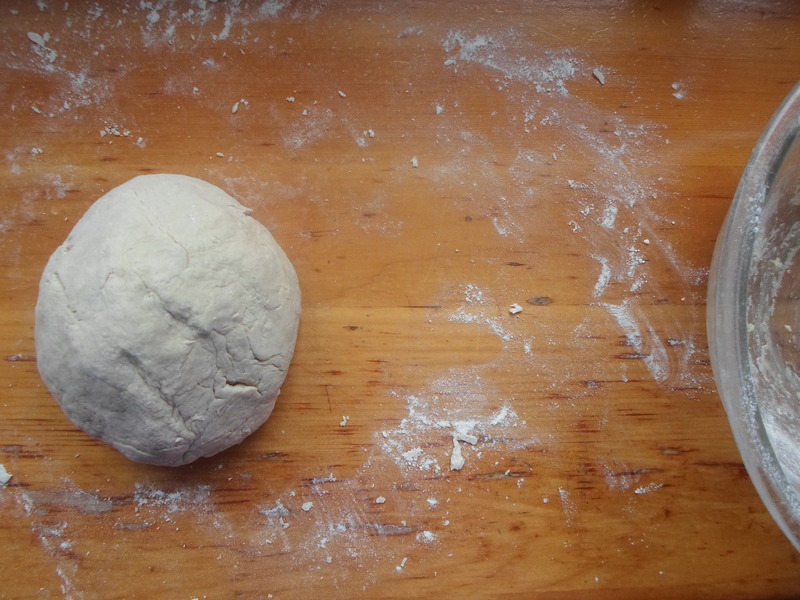 Tip the dough (and any particles that haven’t stuck together) onto a floured surface and knead with the heel of both hands for about 5 minutes. 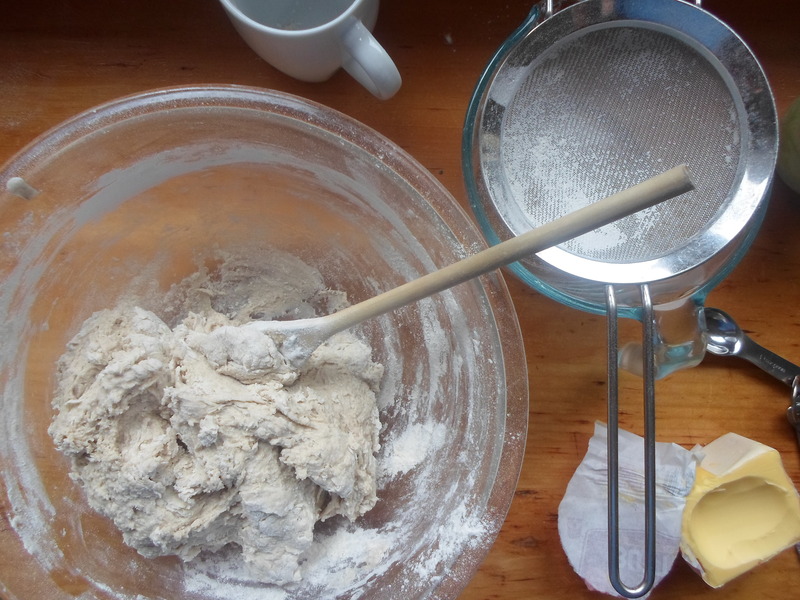 You will probably definitely need to add a touch more flour. Using your fingertips, roll the dough into a big, flat oval and roll up like you would if you were making a cinnamon roll. Knit the edges together between thumb and forefinger, place on a tray and leave to rise for about 3 hours. If you’re a little bit phobic about it not reaching the optimal rising temperature like me, try putting it in a warm oven for the time it takes to rise. Remove the loaf from the oven and heat to 190°C. Bake the bread at this temperature for 10 minutes before turning the temperature down to 175°C and baking for further 40 minutes. It is ready to eat at soon as you pull it out of the oven. Dense and zingy, it is perfect just smeared with a layer of butter, but it also makes a great accompaniment for dinner because it is so flavoursome and savoury. Serve on the side of a stew or top with left over tamarillo salsa! Hi, my name is Dylan and I have a problem. I am addicted to preserving. I just can’t get enough of it; I dream about making jam all day long, I dry the skin of every citrus fruit I ever use and have an ever-growing list of chutneys and pastes that I’m dying to make. Preserves are a great way of extending flavours to times well outside of their seasonality. Sometimes a rainy day can be brightened up a dollop of sugary strawberry jam; a stew can be taken to the next level with the addition of a few crisp fragments of citrus; the deep flavour bleeding into the sauce as it cooks throughout the day. 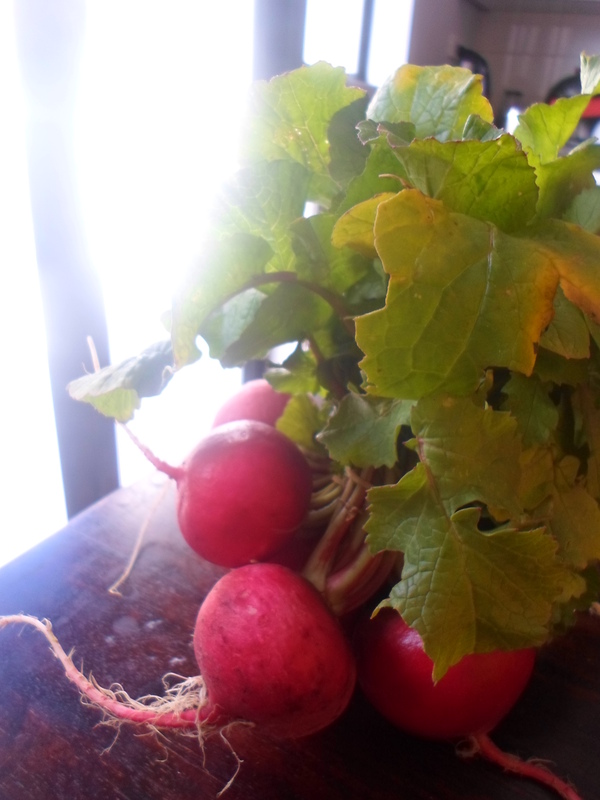 On the flipside, pickled radishes; a delicious use of a winter vegetable are a great way to add a colourful crunch. I have all of these great ideas, but I am running out of jars… and space in my pantry! I have promised myself that this one will be the last one for a while, so it’s a good thing that it’s such a stunner. 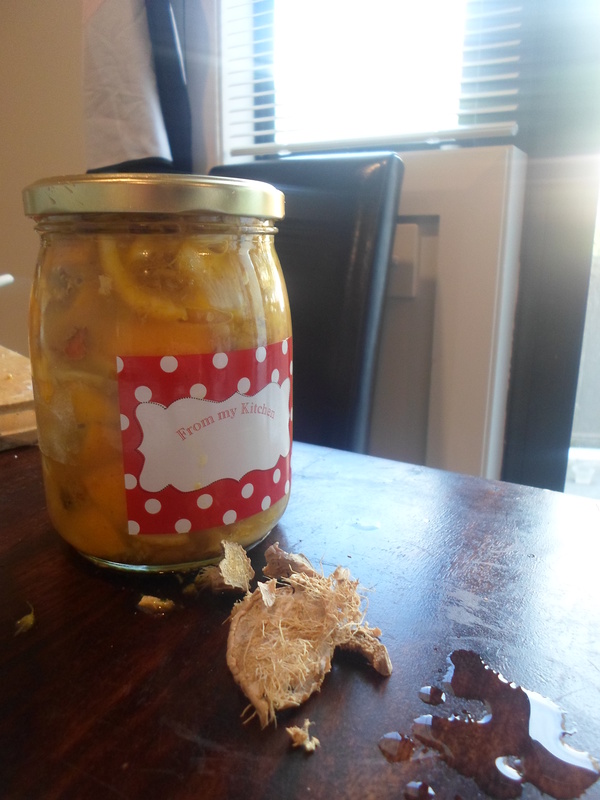 Lemon, ginger and honey is just a comforting winter drink – good for the soul and good for the immune system, so I decided to see how it fared as a chutney combination. I wanted something warming – if it’s going to be of any use in the winter then its warmth has to emanate throughout the body with each bite. Lemon, ginger and turmeric seemed like the ideal combination; it’s tangy, fragrant and warm, but not too spicy or overpowering, and not too sweet. As you can probably tell, this recipe can easily be scaled up or down, depending on the size of your jars. 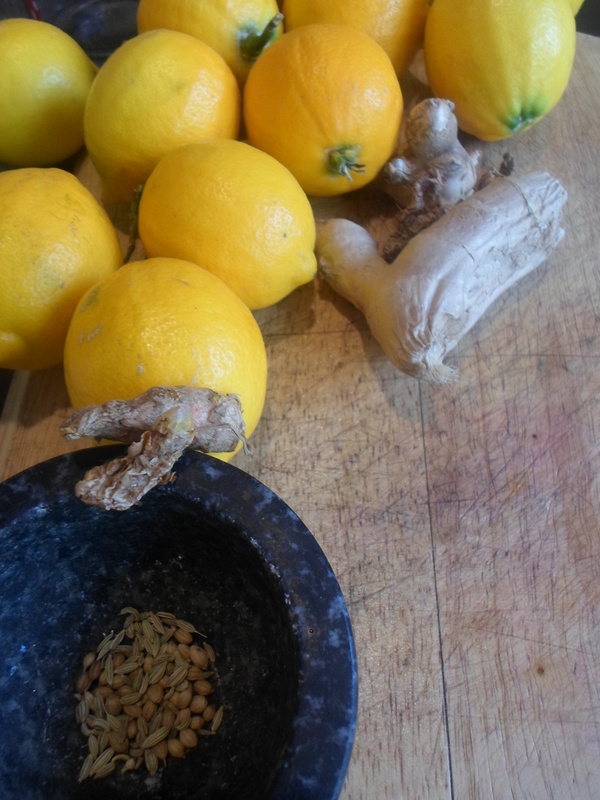 Begin by dicing the ginger and turmeric. 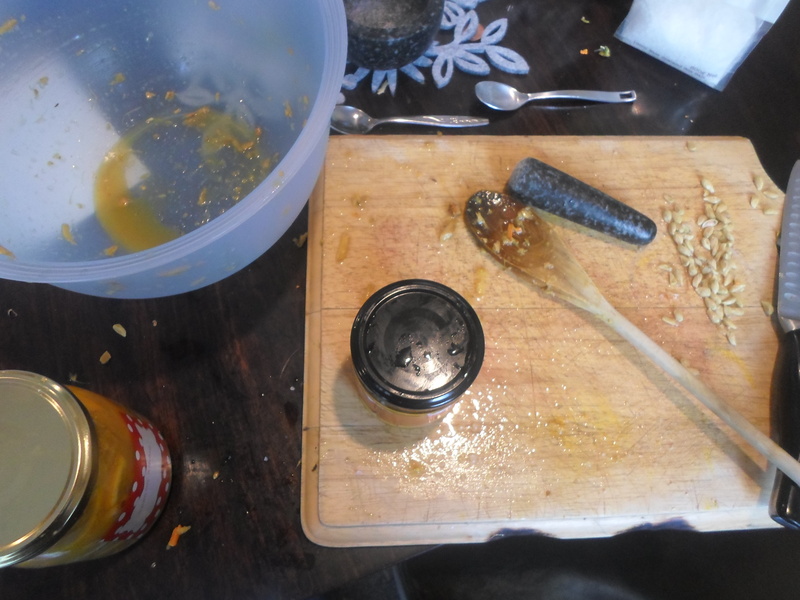 I used three turmeric bulbs and grated them as finely as possible – biting into a big hunk of bright, bitter turmeric is a dreadful thought, something I really wanted to avoid. 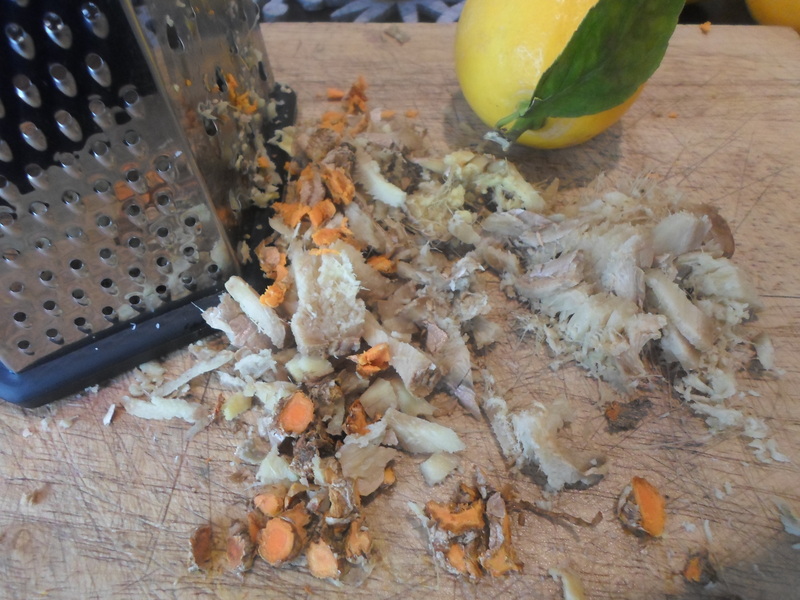 I julienned the ginger root with similar audacity, even though I am not crazy at the idea of a mouthful of ginger, it seems less unpleasant than the turmeric so I tried to keep the slices as thin as I could. Gently heat them in a tablespoon of olive oil, with the fennel and coriander, use a relatively low heat. I added a tablespoon of water to lightly steam them – I wanted to avoid crisping them up in any way possible. It might even work better to steam them over hot water first. Take the pan off the heat and toss through another dash of olive oil and a few caps of vinegar. I used apple cider vinegar for tartness and because it’s the only kind I had. While that pan is filling your kitchen of smells reminiscent of an Arabian marketplace, it’s time to move on to the lemons. As most people on the internet will tell you; organic is best and freshly washed is also good. If you can help it, only pick your lemons once they are ripe, that way they will be juiciest as they stop ripening as soon as they are picked. The recipe that I based mine on (from Ottolenghi, duh) says to quarter them lengthways (but not quite to the bottom). For practicality, I diced mine into bite sized pieces; I thought this would make them easier to squeeze into the jar and easier to spoon out afterwards. Stir through the ginger and turmeric, the salt, and any herbs you think would suit; I used rosemary and a sprinkle of dried thyme. Jam as much of the mixture into each jar as possible, it can be quite a messy job but try and keep the juice off the table and floor as much as possible! Seal the jars and leave in a cool, dark cupboard for a week. Side note: make sure your jars are sterile you could end up with a fungus forest instead. If patience is not a virtue you are the beholder of, then this is probably not something you should be experimenting with as this is merely the beginning. After a week, squish the lemons down and pour the juice of the six remaining lemons overtop, that should almost take your jar to capacity, add water to make up the difference and add another little glug of oil. 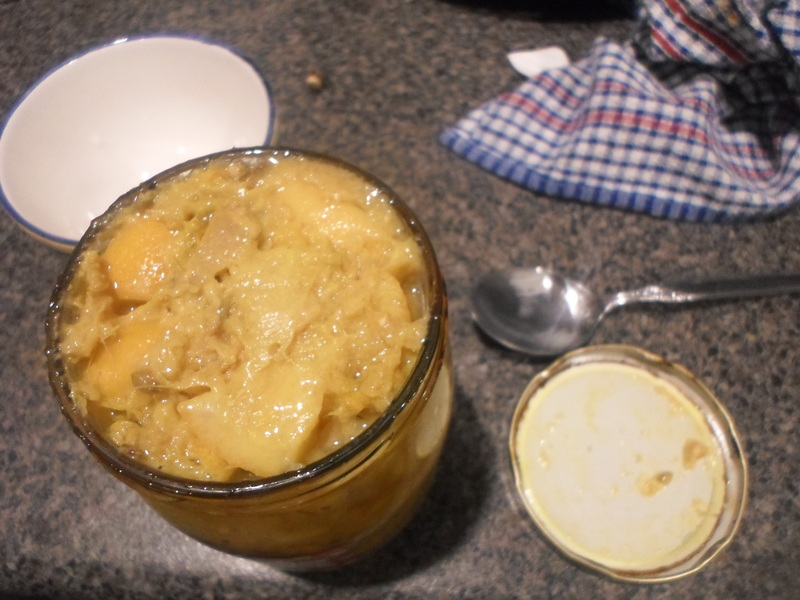 Reseal and leave in the cupboard for at least four weeks to ferment. The fibres within the lemon rind will slowly break down, absorbing its own juice and the flavours of the ginger; sweet, tangy and soft. Serve atop warm couscous, stir-fry with vegetables or any other kind of cooking. 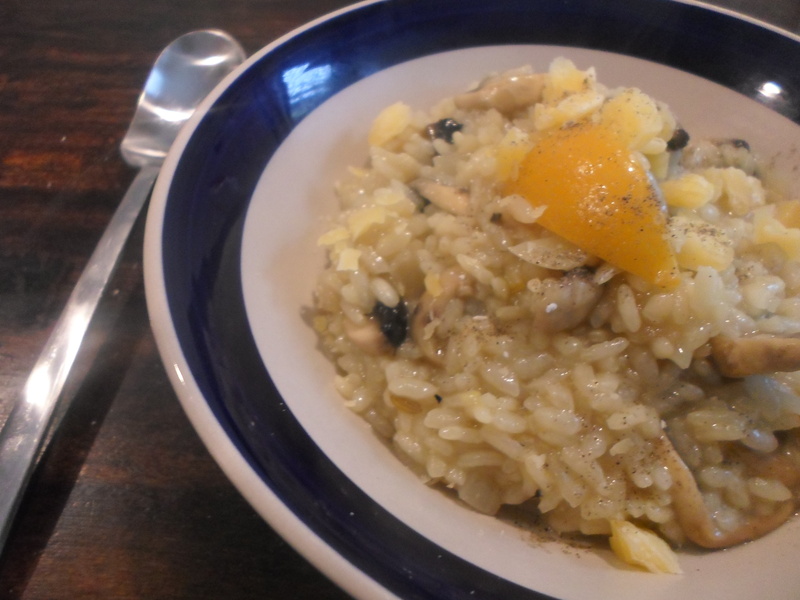 I added a few tablespoons to some sautéed mushrooms for a lemon and mushroom risotto and loved the tang it gave in contrast of the sweet chicken broth. Now for a bit of festivity! This week’s instalment of Chippie Tuesday is going to be a bit of an ode to the French flag, the Tricolore. I love carrots, and parsnips, and I recently discovered purple carrots, and have since taken quite a liking to them too. So, while it is not a completely accurate recreation, I have taken some creative licensing in creating a chip version of the flag in celebration of Bastille Day. 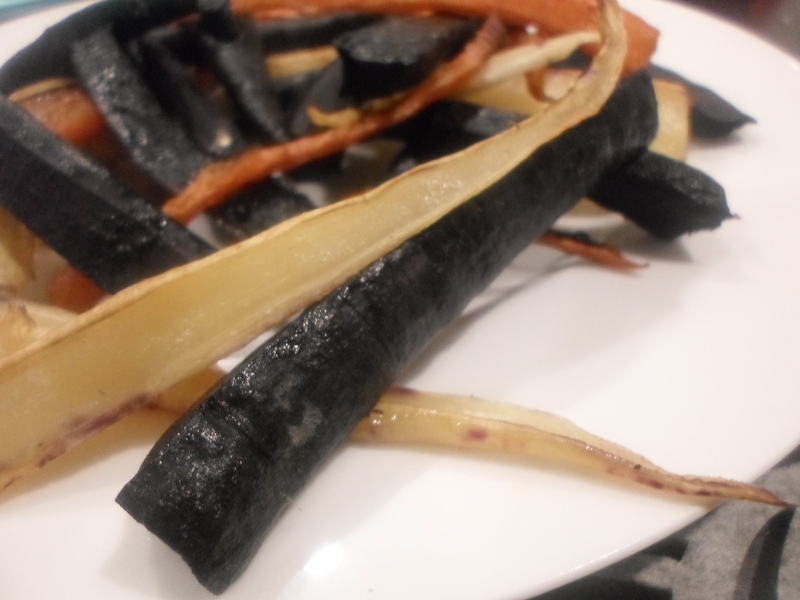 I had seen purple carrots often enough, but I had never garnered up the courage to actually try them, until recently. I was pleasantly surprised by their flavour; like carrots and parsnips, their earthy scent fills the air like they have just been plucked from the rich soil they are grown in. They lack the distinct crunch of a regular carrot, but when the knife slides through them with satisfying ease, you know that, when cooked, the soft flesh with be comforting and moreish. Begin by switching your oven on to 180°C. I have found that a fan forced bake will crisp the chips up better than an ordinary bake, but if your oven doesn’t have this option, then it’s not the end of the world. 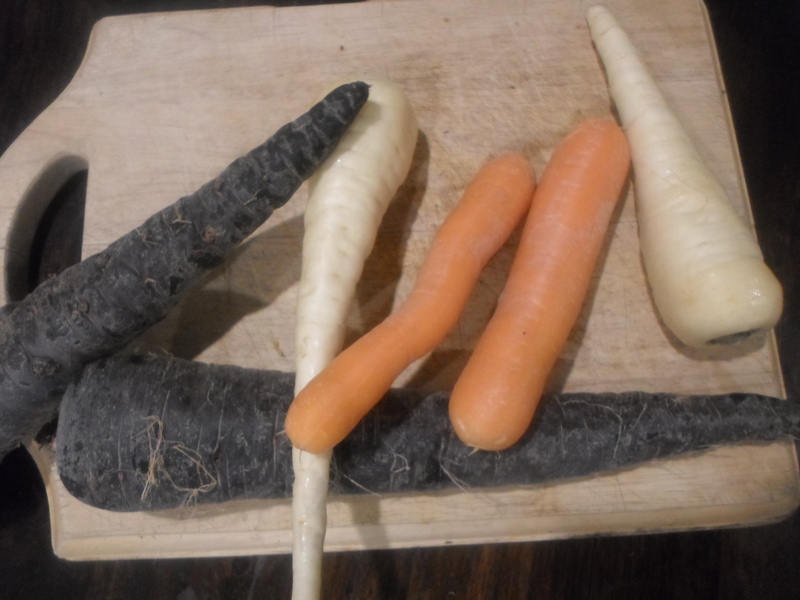 Slice any amount of any combination of coloured carrots into sticks of your desired thickness, I cut mine into eights lengthways and then each thin strip in half – about the length and width of your index finger (without thinking about it in terms too cannibalistic). Coat the chips in olive oil with a sprinkling of salt and pepper, you don’t need much else because the natural sugars will caramelise, enhancing their sweetness and flavour as they roast. That doesn’t mean to say that adding a little inspiration is out of the question; I find carrots are matched brilliantly with balsamic vinegar, soy sauce or even honey if your sweet tooth is influencing you. 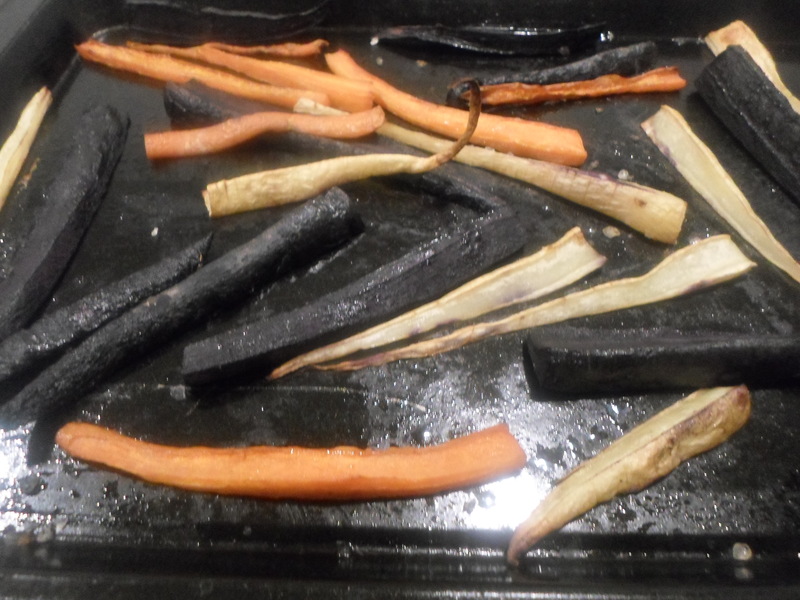 Roast for about 30 minutes; the cooking time really depends, not only on your oven, but also how thinly sliced your carrots are – so don’t leave them unattended too long! Serve them hot with an extra sprinkle of salt and enjoy this vaguely festive snack! 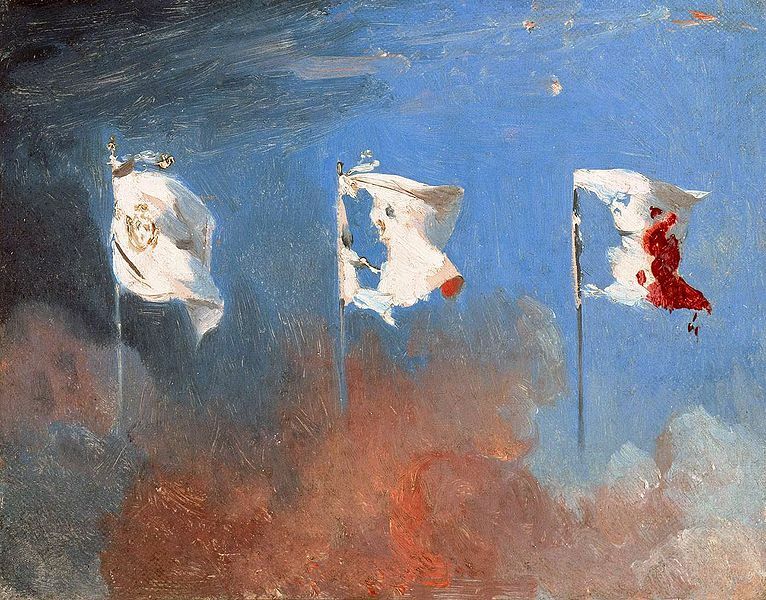 I have always had a keen interest in history, and although the majority of what we learn in schools centres around New Zealand’s history, the French Revolution has fascinated me for a long time; the integral catalyst of this event being the storming of the Bastille. 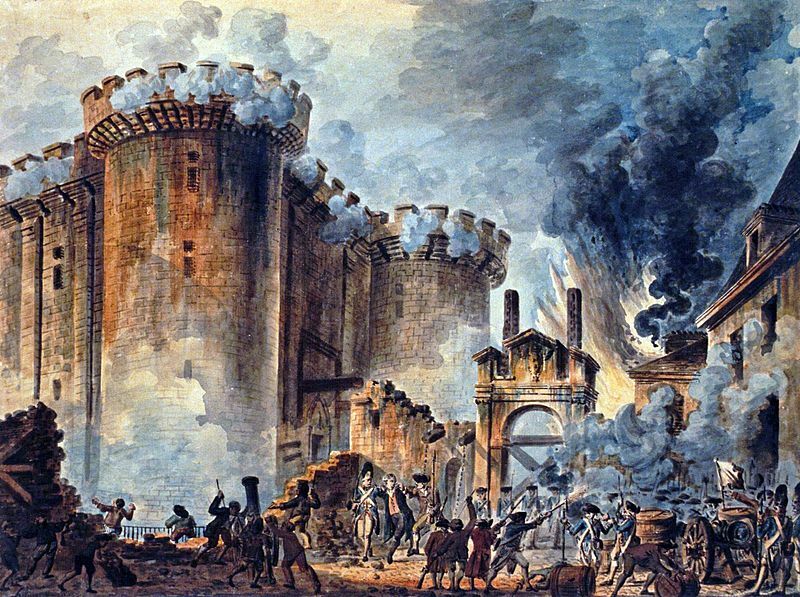 The founding of what we now know as Bastille Day occurred on July 14, 1789, when a mob of peasants, dissatisfied with the monarch, stormed the Bastille prison in Paris and freed every single prisoner – all seven of them. While the repercussions affected the French Empire of a grand scale, the actual event was seen more as a non-event. 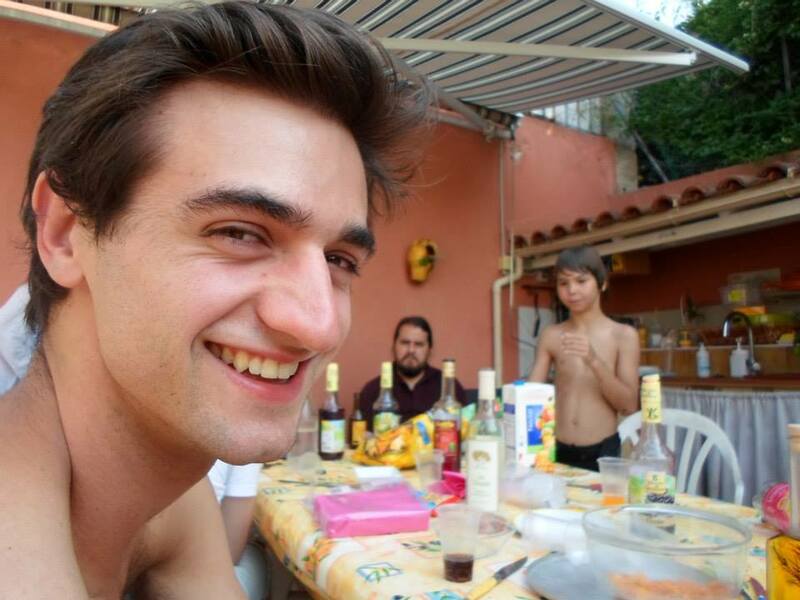 Perhaps that is why the French are the only ones who don’t call it Bastille Day, instead it is known as le quatorze juillet – the 14th of July. In effect, the date is more important than anything that happened on it, the date that symbolises the beginning of the working class uprising – the event is so unimportant that I have encountered born-and-bred French citizens who have never learnt about what happened at Bastille. Le quatorze julliet is the ideal public holiday – it falls in the middle of summer so the sun is always shining, nobody has to go to work so you can enjoy the balmy weather with friends, eating, drinking and being merry, and the fireworks displays are of world class quality, but how has the way it is celebrated changed how it is perceived? A military parade is held in Paris each year from the Arc de Triomphe along the Champs-Elysée in an epitome of patriotism; the warm summer air carrying the notes of La Marseillaise, fluttering Tricolore flags gripped by children and adults alike, who crowd the street in unruly lines. Further South, the celebrations’ leniency increases with the humidity. Many people opt for escaping the city confines to the beach or the countryside to laze about by the pool with fresh salads, cold beer and homemade pizzas. They may get back to the city to see the evening fireworks display, or maybe not. 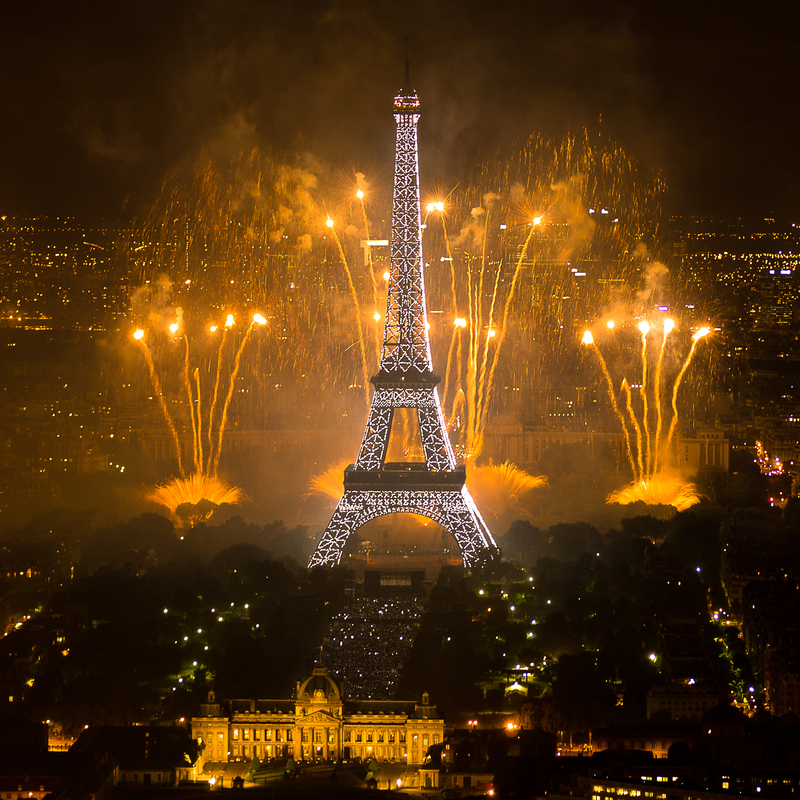 While this kind of celebration, or more accurately – lack of celebration, could be taken as a slight to the birth of modern-day France, and a remembrance of those involved, especially in comparison to the celebratory fanfare of the 4th of July, I think it should be interpreted as the base-level, relaxed celebration that it is. After all, the Storming of the Bastille was brought about by many things; the absolute control of the monarchy being one of them, but also the exorbitantly high taxes and shortage of food, were the driving forces. Daily life is made almost impossible when you can’t buy bread, something the nobility didn’t understand – substituting bread for cake seemed an appropriate solution. Keeping that in mind, should this holiday not be about enjoying and celebrating the fact that we can now afford to eat, that buying a baguette costs less than a euro and not a day’s wage? For me, every day is a celebration of food; mostly thinking about it, but on occasions eating and creating too. 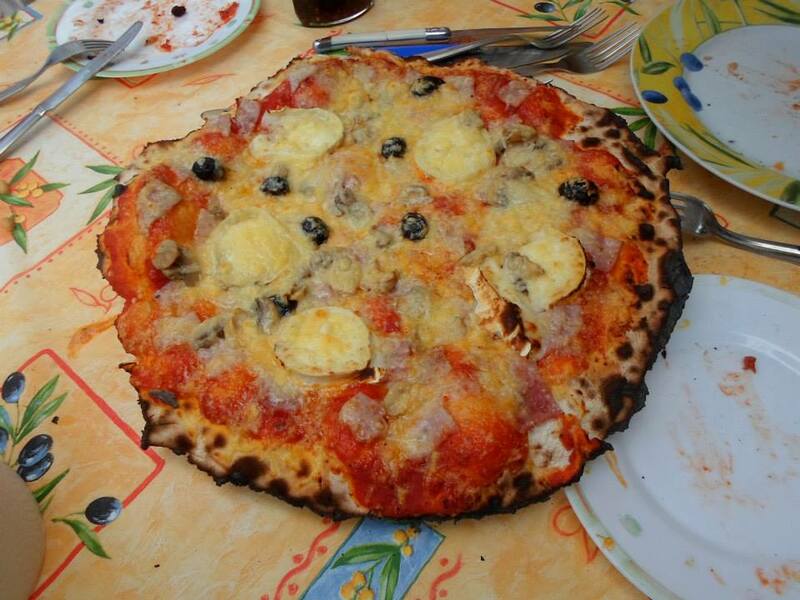 My first Bastille Day was my first encounter with a traditional wood fire pizza oven. I had seen them before, and eaten pizza cooked on them, but I had never actually operated one. 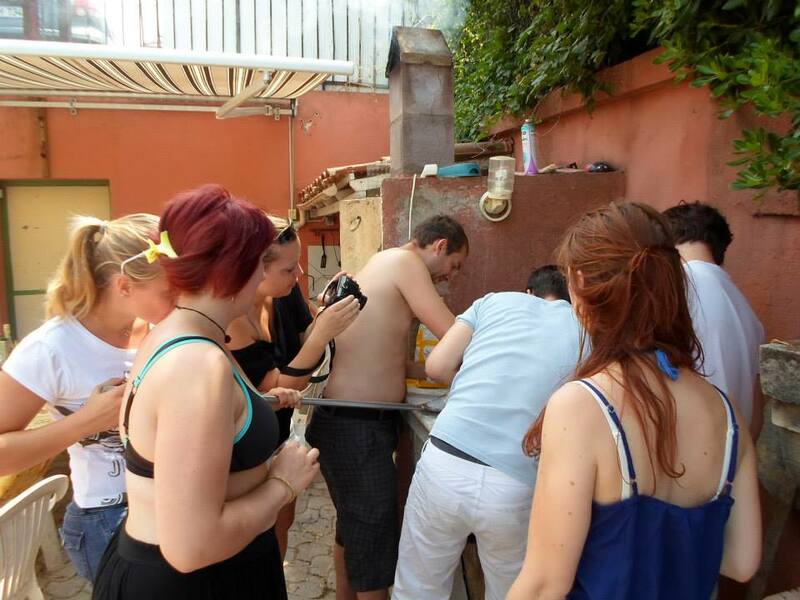 I know that making your own pizza is not the French-est sounding activity, but it was such an interesting experience; a daylong event! The heat of the oven, after hours of feeding the fire log after log, blisters the dough and liquefies the cheese and toppings, a wondrous contrast to the crunch of the base. If you make each base the size of a small plate it is a perfect serving for one – so you don’t have to compromise on toppings; it can be just what you like! But it’s more fun if you leave everyone to design their own and then share them around, you might just find a new favourite. For me, it was the very French combination of goat’s cheese and honey – I know it sounds odd, but believe me when I say it is a match made in heaven!